VOORHEES, N.J. -- Training camp is a time for experimentation, so it's tough to take anything from line combinations and defense pairings. But on Sunday, during the second day of training camp here at Flyers Skate Zone, there was one interesting sight -- Jeff Carter centered a line with Mike Richards on the left and Nikolai Zherdev on the right. With Carter, Richards, Danny Briere and Claude Giroux, the Flyers have four natural centers for their top three lines. That leaves it up to the coach to figure out some interesting math. "I've had a conversation with all the centermen," coach Peter Laviolette said. "All the centermen probably feel they're better suited for the middle. That's what they've done, that's where they're comfortable, (but) all of them can play the wing." On Sunday, Richards was the one pushed over to the wing. On Saturday, it was Giroux moving to the wing on a line centered by Richards. Briere (5-foot-10, 179), Giroux (5-11, 172) and Richards (5-11, 195) all are on the small side, meaning the extra room that comes from playing in the middle would benefit them. The 6-foot-3, 200-pound Carter has a build more suited to playing along the wall, and he played on the wing when he returned after his recovery from foot surgery in the playoffs. But when asked which spot he preferred, he said center. "The wing last year was just the team playing so well, we didn't really want to change too much up," Carter said. Laviolette, though, will put the best players on the ice and let the center/wing issue play itself out. "I'll tell you what I told (the players),” he said. "I don't have a direct answer for you as to who we're turning into a right winger or a left wing. I think we're fortunate to be in the position where we have four centermen who can fill those top three spots and have three lines that can go out and hurt you. If that's the case, then I told those guys you may find yourself on the wing for a game, or part of a game, maybe you mix it up shift to shift. If Carter and Richards are on the ice together, I don't think it really matters who plays center. Cartsie can play, Richards can play. Same if it's Richards or Giroux. "If we're healthy all year and I have to battle that, that's a good thing." Shuffling the deck -- Laviolette switched up three of his forward lines Sunday. Carter, Richards and Zherdev were one trio, with Danny Briere centering Scott Hartnell and Daniel Carcillo; Claude Giroux between James van Riemsdyk and Bill Guerin; and Darroll Powe centering Ian Laperriere and Jody Shelley, the only holdover line from Saturday. The defense pairings were switched consistently. Part of that is due to the continued absence of Chris Pronger, who still is recovering from knee surgery last month. It's also due to having newcomers Andrej Meszaros, Sean O'Donnell and Matt Walker. "Prongs and Matty (Carle) played great all year," said Laviolette. "Whether you mess with that I don't know. We'll cross that when we get to it and get everyone healthy." Healthy again -- When the Stanley Cup Final ended in June, Jeff Carter retreated to his home and just put his feet up for a while. He had no choice, actually, as it was the first chance he had to really heal his two broken feet. Carter broke his left foot in a game March 21 and missed about two weeks. Then he broke his right foot in Game 4 of the Flyers' first-round playoff series against the New Jersey Devils. He missed a month but returned for the final two games of the Eastern Conference Finals, and then gutted his way through the Stanley Cup Final against Chicago. He had just a goal and an assist, and obviously wasn't the same player who had 33 goals during the regular season. Carter said it took a while into the summer before he finally felt like himself. "I was assured they were going to heal up, it just took time," he said. "At the start of the summer I would walk around and my feet would swell right up. It was scary at first, but it got less and less as the weeks went by and I feel pretty good now." JVR gaining in size -- James van Riemsdyk realized he wore down as the season went on, and as he got ready for his second NHL season, he wanted to make sure there would be no repeat of that performance. 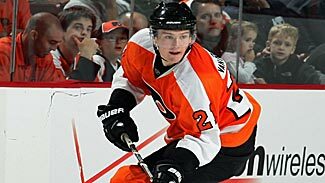 In his first 50 games, van Riemsdyk had 11 goals and 31 points. But in his final 28 games, he had just 3 goals and 4 points, and in 21 playoff games, he had just 3 goals. "It was a mental grind playing that many games in that short a time," van Riemsdyk said. "Physically you're playing against the strongest, best, most talented guys in the world. It was a long schedule, longer then I've ever played before, so that was an adjustment as well." Van Riemsdyk spent the summer working at Prentiss Hockey Performance in Darien, Conn., where he said he put on about 11 pounds. "I wanted to work on my strength and explosiveness," he said. "It's something I really worked hard on over the summer and made some pretty substantial gains, so I can't wait to put it to use on the ice and test it out." 'Less is more' fine with Pronger -- Chris Pronger has been conspicuous by his absence from training camp drills, instead skating early each morning, prior to his teammates hitting the ice, while he recovers from arthroscopic surgery on his right knee last month. One of the big issues following the playoffs last season was finding a way to cut back on Pronger's ice time. The 35-year-old defenseman was fifth in the League during the regular season, averaging 25:55 per game, but that number jumped to 29:03 in the postseason, including eight games of more than 30 minutes. During the playoffs, coach Peter Laviolette almost exclusively played four defensemen -- Pronger and Matt Carle and Kimmo Timonen and Braydon Coburn. Over the summer, Flyers GM Paul Holmgren added three veteran defensemen in Andrej Meszaros, Sean O'Donnell and Matt Walker. The hope is those three can take some of the regular-season minutes from Pronger. "I think with the depth we have, we'll be rolling three sets all year which will obviously cut down on mine and Kimmo's minutes, the top four," Pronger said. "It will take some of our minutes away and allow us to be fresh."